Soundcraft has released v4.7 of its software for the Vi Series. The new V4.7 release of software for Harman's Soundcraft Vi Series range of digital consoles brings an input capacity increase for the Vi4 model, as well as new Virtual Vi software for the Vi1 and a number of feature upgrades . The Soundcraft Vi4 can now handle 96 inputs to mix, bringing it into line with the Vi2 and Vi6 models, and show-files are now compatible between Vi2, 4 and 6 consoles, so settings can be moved between consoles from a USB memory stick. To take advantage of the 96 inputs to mix on the Vi4, 3 DSP cards must be fitted to the local rack, so existing Vi4 owners can upgrade. Vi4 consoles with only 2 DSP cards will be uplifted to 64 inputs to mix, from 48. Similarly, rental companies with inventories of both Vi4 and Vi6 can now standardize on local racks. The same software update brings the dedicated Virtual Vi offline editor for the Vi1 console. Other software enhancements in V4.7 include EQ width control options in Q or octaves delay unit settings in milliseconds, metres or feet & inches, and a number of other user interface enhancements. 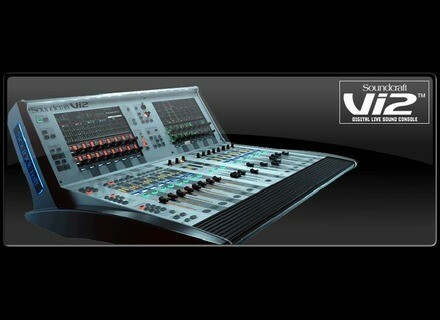 The new software can be downloaded at www.soundcraft.com/downloads/software.aspx. [NAMM] Soundcraft Si Compact V2 Software Soundcraft’s small-format digital console Si Compact has received an upgrade with the V2 software release. AKG VM2 for Soundcraft Vi Series Soundcraft and AKG have introduced VM2 (Vistonics Microphone Monitoring), designed to allow you to monitor the status of any Harman HiQnet-compatible AKG radio microphone from a Soundcraft Vi Series console surface.